Be met our staff at the check point at Shichahai area. 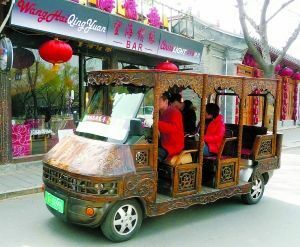 Start the interesting battery car trip from Qianhai Xijie Street, a famous Hutong district west of Qianhai Lake. Then we come to the beautiful Shichahai Lake area while Silver Ingot Bridge provides the best view for the lake. There is a famous bar street in the lakeshore, called Shichahai Bar Street, distributed with characteristics bars reputed for various wines and delicious snacks. Pass though Liuyinjie Street, a dignified street famous for it is a cluster of former residences of past celebrities. Prince Gong’s Mansion is the most popular and it is the largest mansion in Qing Dynasty.